I still remember having the discussion with my fellow therapists in graduate school about why I didn’t like Facebook. I was the only male of 19 students in the program. I explained to them, with a self-righteous smirk, that Facebook was just a fad, that it robbed people of real connection, and that I wouldn’t become involved with it because “I preferred real friends.” Then they created a Facebook account in my name, posted a picture of me in the account, and told me I needed to monitor the account now because people were contacting me. That was 2006, and I still use that same account, now more than ever. There are clearly good and bad things about Facebook and other social media platforms, but does the good outweigh the bad? Should Facebook take a prominent place in our lives, or rather, should we be worried that it already does just that? Stay-at-home moms, college students, teenagers, and business owners may, from their perspective, actually now NEED Facebook. WHERE DID THAT COME FROM? Today, businesses can’t ignore the client networking and advertising that happens on social media like Pinterest and Facebook. College life breathes through Facebook walls and newsfeeds. Teenagers find expression through Facebook, and they often feel ostracized if they don’t participate in social media. 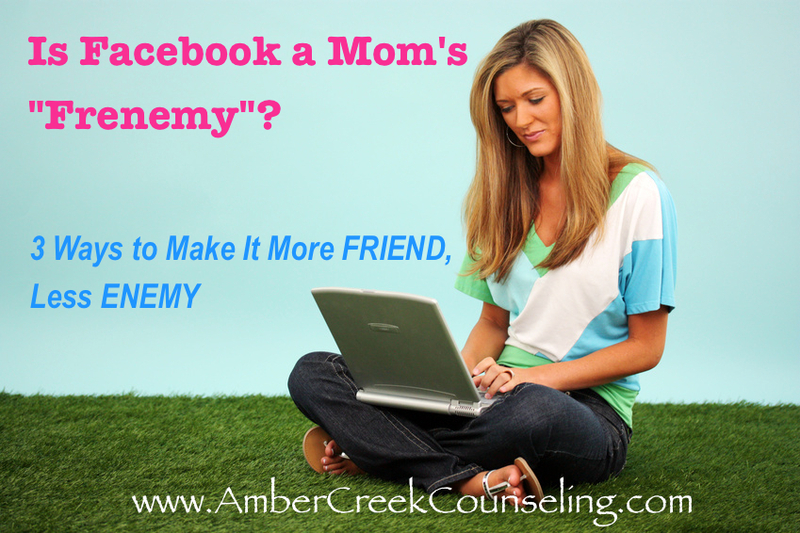 Parents can use Facebook as a window into their children’s focus, priorities, and concerns. The demographic using social media that I find most interesting, however, is the 20-45 year old “mommy bloggers,” the stay-at-home moms, and the part-time employed moms. They have an online footprint that is anything but insignificant. So, there are clearly good things and not-so-good things with moms and Facebook. I want to focus on those issues today. Facebook can provide the sense of connection and community that society provided long before technology took such a foothold in our lives. Meeting socially in a town square, visiting neighbors for tea, and weekly letter-writing were mostly left behind as technology sped up the pace of our lives and demanded we adapt to the change. Facebook and other social media became a fast fixture in our lives as we hungered for the connection and sense of community that was lacking in our increasingly “self-serve” and independent lifestyles. Moms particularly benefit from Facebook as they seek validation, empathy, and connection from other women who may be out of their reach, either because of geography or daily schedule. Facebook can certainly add to a mom’s parenting experience. What greater comfort can a mom feel during the work day when she is worried about her child’s health, proud of her child’s successes, touched by a child’s love, or embarrassed and insecure about her lack of parenting knowledge, than to be able to instantly share those feelings and experiences with a community of people who know what she is feeling? Almost instantly, moms can hear words of encouragement, reassurances that things will work out, suggestions for almost any parenting dilemma, and most importantly, words of empathy and validation when life gets hard. They can get creative ideas for helping their kids in school, crafty ideas for cooking or decoration, and comic relief from moms who see the humor in their children’s learning experience. Moms can share pictures of their children and keep a kind of “social journal” of the moments that make up her parenting experience day by day. Even a simple collection of “likes” on a Facebook post can reassure a mom that what she is doing is worthwhile. Ideally, Facebook would only provide reasons for encouragement and self-improvement. Unfortunately, Facebook also tends to show more of mothers’ successes and shining parenting moments than it does the struggles that every mom must face. And often the struggles that are described on a status post will be only briefly described, often answered with humor and light-hearted support, and then seemingly be resolved quickly as they are dealt with out of view of the Facebook newsfeed. For some moms, that can leave them feeling emotionally inadequate. When the reality of day-to-day parenting struggles is very draining and hard to endure, some moms feel they must not be coping with things as well as others do. They feel they must be less capable of “bouncing back” when a hard day hits because their Facebook friends surely must not have struggled as much. Also, in an effort to be recognized, appreciated, and praised for their abilities, many moms will post on Facebook their best parenting moments, greatest successes, most perfect baking creations, and most humorous stories of their kids. Seeing how accomplished and “perfect” all those women are can leave other moms feeling that they will never keep up to that standard — in other words, that they are behaviorally inadequate. We all do it at some point: comparing our average or mediocre moments to the seemingly “perfect” moments of others. It’s not fair, and it’s not based on reality! It takes practice to break out of that pattern, but it is possible. I work with clients on this very issue everyday, and I often hear clients describing themselves in a comparison to the moms they know online. Sadly, bringing parenting topics up on your Facebook status can backfire on you. Sometimes we start out wanting very simple advice on a certain topic, and the comments that follow can become overwhelming, depressing, or unhelpful. Sometimes we get unsolicited advice, and whether it was intended or not, we feel we are being lectured or judged. Sometimes in-laws see our posted comments or questions and they then cast judgment on us as parents. Sometimes friends or “friends of friends” become offended, jealous, or upset because they completely misinterpreted the initial comment. And sometimes we get caught up in our own pattern of comparing ourselves to others when the “perfect mom” responds with a “perfect” comment, and we end up feeling inadequate. Sometimes we don’t really want advice at all; we just crave a listening ear to validate us. And just like with marital struggles, sometimes we resolve and make peace with our own family struggles much faster than other people will — but even though we have moved on, other people may hold on to our issue/concern long afterward. 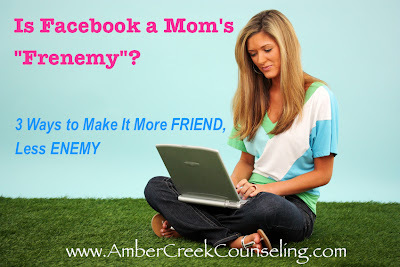 So, what should moms do to ensure that Facebook only benefits them? 1. Don’t make Facebook your primary source of connection. It is important to remember that while Facebook can be a fun, comforting, and bonding network, it shouldn’t become our main source of connection. Our primary source of connection and comfort should always be our partner if we are in a relationship, or a close relative or close friend if we are single, NOT the community we see mostly online. Facebook will ultimately fall short of meeting the core emotional needs we all have, so it should supplement our sense of social connection with others, not replace it completely. 2. Don’t base your self-worth and sense of personal success on the support and encouragement you receive online. Another mom’s success doesn’t mean we aren’t successful, too. We are all valuable and meaningful in our own families, regardless of how we think we match up to our Facebook friends. I recommend taking each person’s online comments with a grain of salt; everyone will have good days and bad days, and sometimes the greatest gift we can give to people is the gift of forgetting their bad days for them. 3. Don’t be afraid to set emotional boundaries in your life! You wouldn’t let a creepy guy snuggle up close to you on a bus because you would either ask him for space or stand up and walk away. We should set similar boundaries emotionally — if in-laws, friends, or even Facebook tries to manipulate our feelings or starts to bleed into too much of our life, it’s ok to push back and set boundaries. Let Facebook, Pinterest, and blogs bring color and variety to your life — don’t let them BECOME your life.